Detecting Dire Diseases – with a Selfie? They say the eyes are the windows to the soul. But with a new smartphone app, the eyes may be a diagnostic window into the body that might be used to prevent a horrible disease — pancreatic cancer. A research team at the University of Washington led by [Alex Mariakakis] recently described what they call “BiliScreen,” a smartphone app to detect pancreatic disease by imaging a patient’s eyes. Pancreatic cancer is particularly deadly because it remains asymptomatic until it’s too late. One early symptom is jaundice, a yellow-green discoloration of the skin and the whites of the eyes as the blood pigment bilirubin accumulates in the body. By the time enough bilirubin accumulates to be visible to the naked eye, things have generally progressed to the inoperable stage. BiliScreen captures images of the eyes and uses image analysis techniques to detect jaundice long before anyone would notice. To control lighting conditions, a 3D-printed mask similar to Google’s Cardboard can be used; there’s also a pair of glasses that look like something from [Sir Elton John]’s collection that can be used to correct for ambient lighting. Results look promising so far, with BiliScreen correctly identifying elevated bilirubin levels 90% of the time, as compared to later blood tests. Their research paper has all the details (PDF link). Tools like BiliScreen could really make a difference in the early diagnosis and prevention of diseases. For an even less intrusive way to intervene in disease processes early, we might also be able to use WiFi to passively detect Parkinson’s. You’d think that with as many sick people as there are in the world, it wouldn’t be too difficult for a doctor in training to get practice. It’s easy to get experience treating common complaints like colds and the flu, but it might take the young doctor a while to run across a dissecting abdominal aortic aneurysm, and that won’t be the time for on the job training. Enter the SP, or standardized patient – people trained to deliver information to medical students to simulate a particular case. There’s a problem with SPs, though. While it’s easy enough to coach someone to deliver an oral history reflecting a medical condition, the student eventually needs to examine the SP, which will reveal none of the signs and symptoms associated with the simulated case. To remedy this, [Chris Sanders] and [J Scott Christianson] from the University of Missouri developed an open-source RFID stethoscope to simulate patient findings. This is one of those “why didn’t I think of that?” ideas. A cheap stethoscope is fitted with an Arduino, and RFID reader, and a small audio board. RFID tags are placed at diagnostic points over an SP’s chest and abdomen. When the stethoscope is placed over a tag, a specific sound file is fetched from an SD card and played over earbuds. The student doesn’t have to ask, “What am I hearing?” anymore – the actual sound of bruits or borborygmi are heard. We can easily see expanding this system – RFID tags that trigger a faux ultrasound machine to display diagnostic images, or tiny OLED screens displaying tagged images into an otoscope. A good place to start expanding this idea might be this digital stethoscope recorder and analyzer. If you ever watched MacGyver as a kid, you know that given any number of random objects, he could craft the exact tool he would need to get out of a sticky situation. If he ever made his way into the medical research field, you could be sure that this test for Acute Pancreatitis would be among his list of accomplishments. Designed by University of Texas grad student [Brian Zaccheo], the Acute Pancreatitis test seen in the image above looks as unassuming as it is effective. 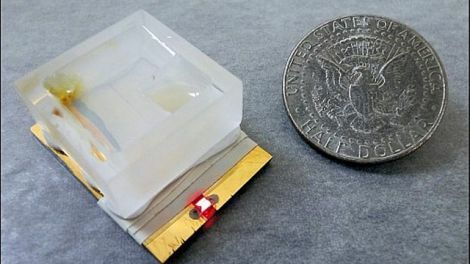 Crafted out of little more than foil, jello, and milk, the test takes under an hour to diagnose patients while costing less than a dollar. The test works by checking the patient’s blood for trypsin, an enzyme present in high concentrations if they are suffering from pancreatitis. Once a few drops of the patient’s blood is placed on the gelatin layer of the test, it is left to sit for a bit, after which sodium hydroxide is added. If elevated trypsin levels are present, it will have eaten through the gelatin and milk protein, creating a pathway for the sodium hydroxide to reach the foil layer. If the foil is dissolved within an hour, a circuit is formed and a small LED lights up, indicating that the patient has acute pancreatitis. The test really is ingenious when you think about it, and will be a huge help to doctors practicing in developing countries, under less than ideal working conditions.